Drones can be a lot of fun to play with. If you are searching for the best toy drones for your kids, then your biggest considerations should be safety, flight time, functionality, the remote controller type, quality, and camera video resolution. In addition, you should look out for other extra features that can make your play time more exciting. Ideally, toy drones should be easy to operate, as this makes them accessible to children and beginners. This review covers the best toy drones on the market and gives you the best toy quadcopters for children to choose from. This nano quadcopter is one of the best toy drones for children older than 12. With a smart remote controller, it is easy to operate even by first-time users. All you have to do is turn on the quadcopter and the remote, then push and pull down the throttle on the top. After the “beep” signal, you will be ready to fly your drone. Moreover, the remote has a compass mode for confidently changing flight direction, and a cool return button. Just push it, and your drone will fly back to you. 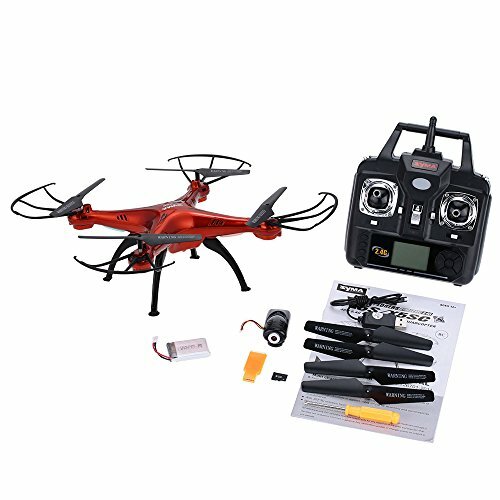 The Eachine drone guarantees a funny playtime due to the 360 degree rollover feature, that will surprise anyone with rolls and flips. The Mini RC Helicopter is an innovative drone toy that is both safe and fun. 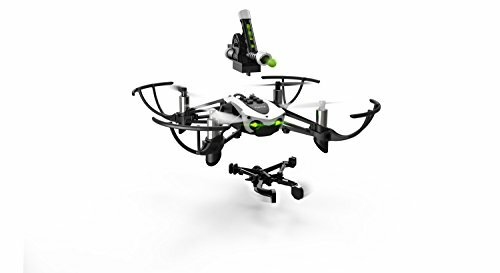 One of the best toy drones for children aged 8-14, the LeIdea quadcopter is innovative, entertaining, and helps kids’ intelligence development. The gadget is made with premium materials that are very resistant to extensive play. The headless mode makes it easy to operate by children. The Stop and Return keys guarantee extra safety, preventing the toy drone from crashing or flying away. Thanks to a beautiful led light, users will be able to fly this toy drone at night as well. 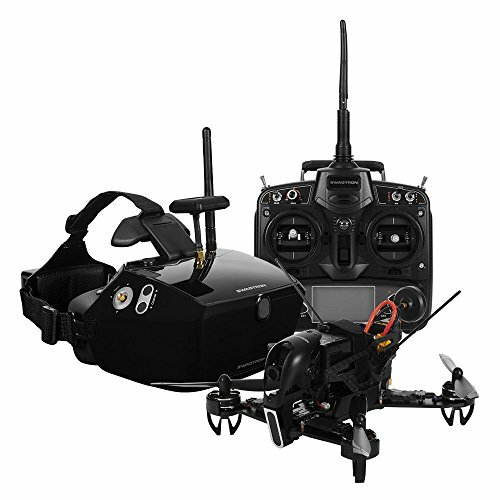 All in all, this toy quad copter will be a joy to fly for the entire family! This toy drone is highly functional. It has an altitude hold function, one-key landing, one-key takeoff, and even sideward flight. It can perform 360-degree flips, and is easy to fly, even for beginners. The device is highly stable when in flight, as it has a 6-axis gyro build. You can control it within a 50-meter radius. 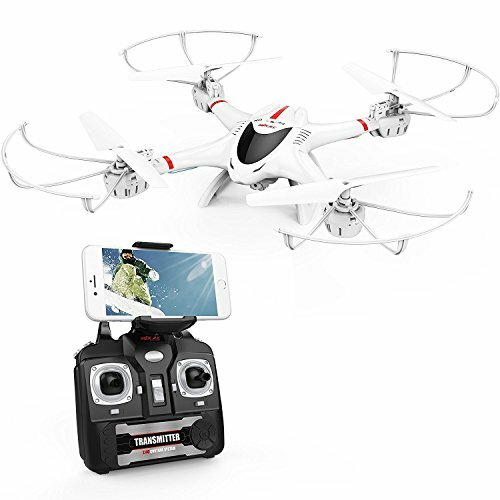 Compatible with all iOS and Android systems, this is one of the best toy drones with camera. 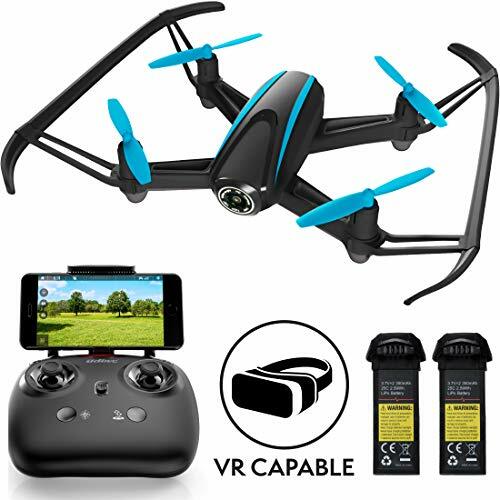 You will be able to connect this toy quadcopter to your phone and view videos and photos while flying. The quadcopter takes about 90 minutes to charge fully, and can then fly for about 6 minutes. As a downside, its flight time is very short in comparison to many other competitor products. Although this mini quadcopter is unstable in windy environments, it still has enough features to warrant a spot on the list of the best toy drones. It is very small and light, and you should always use it indoors. This drone delivers more than you would expect (2.4GHZ spread spectrum technology and a remote control). It also has a multi-functional transmitter. You can use it to switch between high and low speeds, and even perform fast flips. The DeXop toy drone also has an HD camera that can take pictures and videos. Positioned at the bottom of the quadcopter, it allows for better aerial vision. The transmitter uses 4 AA batteries that you will need to purchase separately. The gadget can fly for 10 minutes, and it takes an hour to charge fully. Very user-friendly and reasonably-priced, it is one of the best toy quadcopters for beginners. The Syma X5SC is one of the best toy drones that features flashing lights for super fun play during the day and night. It is built with a 2MP camera that can be used to take amazing aerial pictures and videos. The drone is one of the easiest to fly, being suitable for kids as well. It is designed with the headless mode, and this makes it a lot easier for beginners to operate. Also, stability is enhanced with the 6-axis gyroscope. This quadcopter is considered one of the best toy drones available because of its sleek design. It has a first person view camera that transmits 720p videos to your phone via Wi-Fi. Users also enjoy the stability of this flying gadget. It uses the 6-axis gyro to maintain stability when in the air. The quadcopter takes 120 minutes to charge fully. Once fully charged, you can enjoy about 9 minutes of play time. Although this is short, it is still better than what most other toy drones can offer. You can control this toy drone remotely using the free Android and iOS app. Takes long to charge fully. You can expect it to charge for about 2 hours. 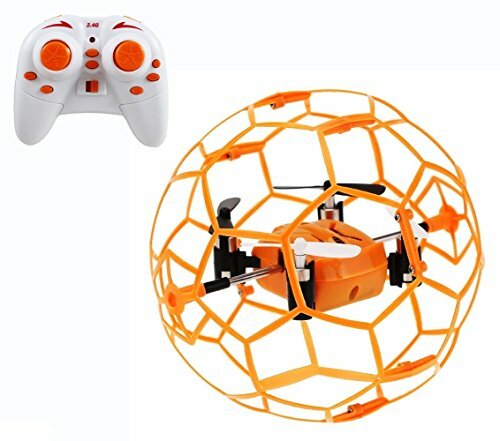 This toy drone is popularly used by beginners. 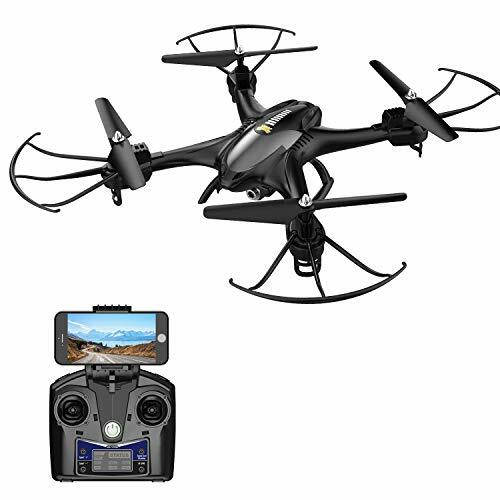 Due to its ease of operation, it is among the best toy drones with security system and return function. The quadcopter can only fly for about 8 minutes, but you can boost your play time by using extra batteries. Its original package comes with two extra batteries that serve to increase the flight time. For more fun, you can perform several tricks with the UAV, like continuous rolls and 3D flips. The range of this toy drone is 50 to 100 meters. It takes about 80 minutes to charge fully. You can also take quality photos and videos, especially if you take advantage of the altitude hold function. It has a short battery life. That said, the manufacturer provides two extra batteries that provide 5 minutes of flight each. This gadget doesn’t exactly look like a typical small quadcopter. It has a unique design and works great as a toy drone. For extra fun, the drone allows you to attach mini-cannons on the top hull. These can then be fired remotely as the drone flies. The Parrot Mambo has advanced sensors that help to keep the device stable when in the air. It works with the Freeflight Mini App or the FlyPad Controller, and is one of the best toy drones for funny acrobatics. This toy drone is equipped with an HD camera that can take 2MP images and high-quality 720p photos. The mini quadcopter was designed specifically to suit beginners. Such people will enjoy using the one-touch takeoff and landing features. It has a headless mode, and an altitude hold function to allow you to take steady pictures from aerial positions. Force1 U45 is at the top of our best toy drones list, owing to its amazing features. 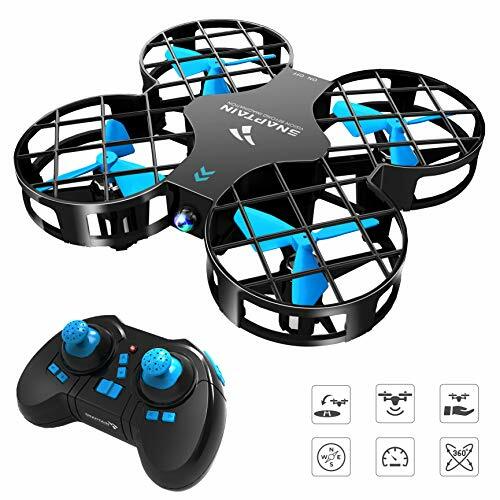 Depending on your preference, you can choose any of the toy quadcopters on the list for an amazing playtime with your kids, friends or family. If you feel like we left out a great toy drone, please let us know in the comment section below.